Welcome to Bears Fans Online! 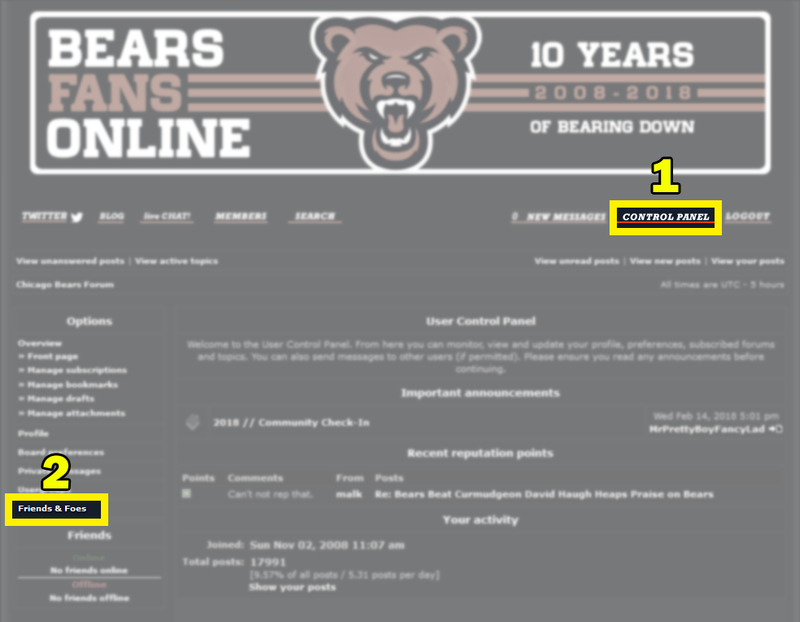 We are a community of Chicago Bears fans, and we welcome fans of the Monsters of the Midway or any walks of NFL fandom to our forum. Since 2008 we have been doing our best to create a gregarious, cozy atmosphere for those who wish to banter about the Chicago Bears, and we hope you find the confines accommodating. To get an idea of the basic code ups and downs (bold text, images, etc) I am going to send you to this link - a well-composed tutorial on the basic ins and outs of a phpbb message board. Be sure to remove the 's' if you post an https:// link. .gifv are not supported yet. .tiff is hit or miss, but I believe they will not embed using the [img] tags. This message board is not a democracy. Users who are confrontational, rude, and otherwise unpleasant can and will be suspended or banned at the whim of any administrator or moderator. We don't mind profanity, but keep it tasteful. No racial, sexist, or homophobic language will be tolerated. Use good judgment with images. Image size, especially in signatures, can clutter up or lag the page. Politics are a very flammable subject, obviously, and while we experimented with it in the past, going forward BFO will no longer permit political threads. There are other places this can be discussed online. Please take advantage of our report function, which can be utilized by clicking the ! icon under every post (as seen below). Users will be given one warning issued via private message to knock off personal attacks, baiting, or other actions that are encouraging infighting. After the first warning I am going to begin suspending members for an allotted amount of time determined by the mod team and I (primarily RING4CHI & wab). If behavior upon return is still poor, bans will be dealt accordingly. If the situation is reprehensible enough or found to be immediately beyond a warning or suspension, the mods and myself will appropriately handle the situation via a ban. User bans are EXCEPTIONALLY rare in this community. I'd like to keep it that way. If a site has any indication of pay-to-view content (Scout.com, The Athletic, etc), please don't copy-paste the contents to our board. Linking to the page along with a brief summary is acceptable. News articles with no paywall or subscription are generally permitted, but please post a link to the page somewhere in your post so we can appropriately direct traffic to the proper places. As always, please use your best judgment and common sense in posting any new material. Use common sense when promoting other communities, fantasy leagues, or other external links. We try to be lenient when it comes to referencing or linking to other message boards but the best way to let that fly without issue is to become an established presence in this community. We're leaving this rule pretty much to the whims of the admin/mod team on a case-by-case basis. This goes for any user promoting their own website or service. For those that prefer to use colored text in their posts, please keep in mind we have a light and dark style for our message board - a light color like yellow is almost illegible against a light background. Choose carefully! The "road" light theme is available by going into your User Control Panel and clicking Board Preferences. Signature size varies, but I'd advise having the image no wider than 550 pixels or taller than 300 pixels. Avatar size is restricted by default to 100x100. BBCode (aka the Bold, Italics, Font Size, etc) use in posts can be a wonderful tool to beautify and organize a long post or relay emphasis. However, if any member routinely abuses these tools, that user is subject to warnings from mods and admins. If abuse continues, I will place that member in a unique "time-out," where they receive reduced permissions in our forums and cannot add flavor to the posts whatsoever. The goal of this measure is to be temporary punishment. That said, we are very lenient with our moderation overall and are willing to work with you if you are willing to work with us. Is there a forum member that you just can't stand? A poster who gets on your last nerve? While I always advocate for reporting posts, and/or PMing myself or the moderator team in cases of targeting or harassment, we do offer an option to "Ignore" a fellow forum member by utilizing the "Foe" feature of our forum software. 2. Click on "Friends & Foes"
Simply add the username to your Foes list, and you'll no longer see their posts. You will have the option to view their post. And just as easily as you can add Foes, you can remove them, too. The "Friends" feature I'm still testing but I don't believe it works *YET*, but look for that in the near future. Please note that you cannot add any administrators or forum moderators to your Foes list. Here at Bears Fans Online.com the general atmosphere we try to create is one of a friendly neighborhood bar: come on in, have a drink, a laugh, and let's talk about the Bears! Be sure to like us on Facebook, and follow us on Twitter! Thanks for visiting and enjoy your time at BFO! I have updated the topic with a more complete guide to our rules. I have updated the topic with additional rules regarding forum etiquette. I feel kind of silly, but ok. Updated the Forum Etiquette section with how you can add someone to your "Foes"/ignore list. Lol....any info regarding burner accounts? Not sure if you’ve seen the drama going on with Draft Dr Phil. Duplicate accounts are prohibited, but it's case-by-case. Point me in the direction of this tomfoolery. still not working. it's no biggie, just wondering how many posts i need to do so, 25 or 50?